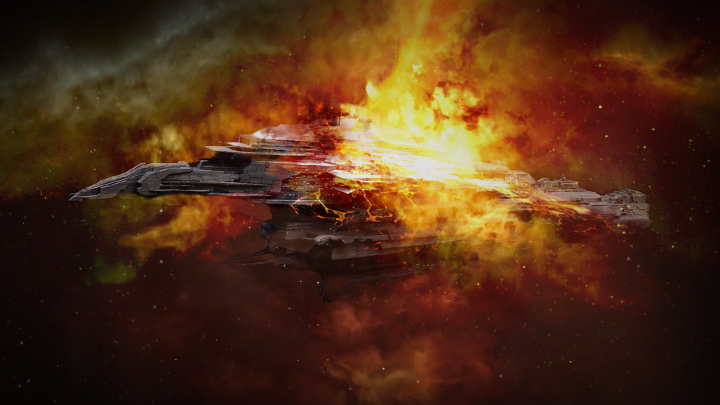 In the last 3 days there have been a large amount of Super Capital losses across New Eden; Ranging from [-LSH-] killing a Nyx Super Carrier and an Erebus Titan to the #REKKINGCREW killing a Hel Super Carrier in a variety of lowsec systems. 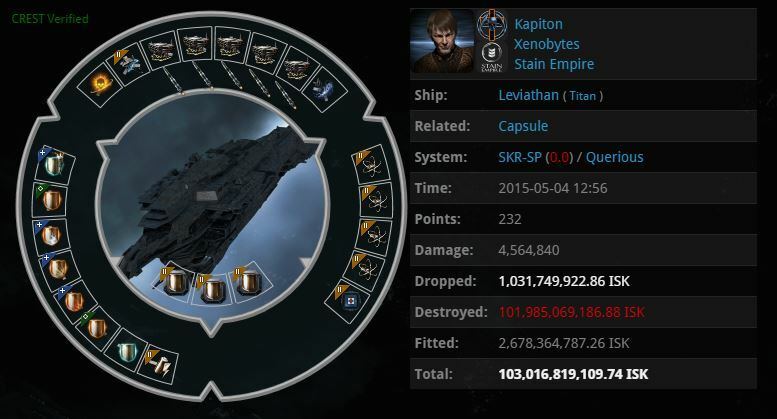 Now an apparent long term “away from game” Leviathan Titan has been killed in the SKR-SP system of Querious. The Leviathan was piloted by Kapiton from Xenobytes [XB] of the Stain Empire [SE] Alliance. He has been a member of [XB] since 2009 but his last killmail was recorded on zKillboard back in January 2012. The Leviathan was killed by a collection of pilots from Black Legion [MEN. ], LowSechnaya Sholupen [-LSH-], Confederation of xXPIZZAXx [PIZZA] and friends. I was just on [PIZZA] team speak catching up with wheniaminspace when he informs me he has to go afk because he might be about to tackle a titan. A few minutes later he hops up again and tells me he is pretty sure it will happen and they are ready to get him on his exit cyno. The titan decloaks cyno’s into SKR and self destructs his cyno but space gets a probe result and warps to it. The guy logs off but space aggresses him then we rage form and burn to destination and get there as it is at half shields. Big shout out to space for letting us get on the mail and sorry capqu for shooting the wreck. I landed initial tackle on the Leviathan on behalf of stephan schneider who was the mastermind behind this kill. The target appeared in a Leviathan, in A-ELE2 just before downtime. After downtime we saw him move his cyno alt to SKR so we sat one jump out with a few dictors, probes etc. He eventually jumped to a self-destruct cyno in system so we entered local and dropped probes. It was my first time probing a titan and I thought I could get him at 32/16 au but finally got his position at 8au. I bookmarked the spot, cycled probes again and warped to the bookmark. I must have gotten real lucky because I landed right on him and decloaked him. He totally panicked and just closed his game. I think this guy just started playing again after a long break; before aggression timers closing your game would have been the correct decision but now it’s just really dumb obviously. Anyway we took no chances and brought some light support/dictors over there while asking [MEN.] and [-LSH-] for heavy backup. He was in no danger of surviving and we probably could have handled it ourselves but didn’t think it was worth taking the chance that he could get saved. Another example of how dangerous it is to move a titan solo nowadays though he probably would have died in Aridia anyway to [-LSH-] if we hadn’t caught him. credit to stephan schneider to the kill, as he is an ubermensch when it comes to hunting supers. I think about 75% of our super kills in this deployment can ultimately be attributed to him. Similarly to that of the Hel pilot destroyed by the #REKKINGCREW who had recently returned to EVE, this pilot was evidently in the same boat as the large rigs, lack of Meta guns and officer hardeners along with the lack of killboard activity suggests. The alliance itself has had it’s most recent kills in the region of Wicked Creek which, if the system of 4-EFLU is used, is a total of 17 mid cyno jumps from the place it died in (obviously not including any shorter gate jumps), making it veru likely that it would have died somewhere on route anyway if that was the final destination. The pilot has been contacted but at the time of writing no response has been received, should that change this post will be updated accordingly. Hello, Neat post. There is an issue with your web site in internet explorer, would check this¡K IE nonetheless is the marketplace leader and a large component to people will leave out your fantastic writing due to this problem. hi!,I really like your writing so a lot! percentage we communicate more about your post on AOL? I need an expert in this house to solve my problem. Maybe that is you! Looking forward to peer you. You can definitely see your expertise within the work you write. The sector hopes for even more passionate writers like you who are not afraid to say how they believe. Always follow your heart. Wow, superb blog layout! How long have you been running a blog for? you make running a blog glance easy. The total glance of your website is magnificent, let alone the content! I will immediately grab your rss as I can not in finding your email subscription hyperlink or e-newsletter service. Do you’ve any? Please allow me realize so that I may just subscribe. Thanks. Thanks for sharing excellent informations. Your web-site is very cool. I’m impressed by the details that you have on this site. It reveals how nicely you perceive this subject. Bookmarked this website page, will come back for extra articles. You, my pal, ROCK! I found simply the information I already searched everywhere and simply couldn’t come across. What a great web site. I simply want to mention I’m beginner to blogging and site-building and honestly enjoyed this blog site. Likely I’m going to bookmark your site . You definitely come with fantastic articles and reviews. Cheers for sharing with us your web-site. Valuable info. Fortunate me I found your web site by accident, and I am surprised why this coincidence did not took place in advance! I bookmarked it. hi!,I like your writing very a lot! proportion we communicate more about your post on AOL? I require an expert on this house to solve my problem. May be that is you! Taking a look ahead to see you. magnificent put up, very informative. I’m wondering why the opposite experts of this sector don’t realize this. You must continue your writing. I’m sure, you have a great readers’ base already! What blog site websites would certainly be good for a small company in floral as well as presents? Exactly how can I import my blog site to another gmail account? Leave a Reply to Beach Resort Click here to cancel reply.